Smart or casual, long or short, plain or patterned. It’s hard to think of a shoe design that’s more versatile than the converse sneaker. With its roots firmly in the sporting tradition, the Converse sneaker has escaped the confines of sporty styling and branched out into the wider world of fashion, with stunning results. So what makes the converse sneaker so special and how do you wear it to create your own individual flair? Emma Hill wears black and white converse with black jeans, an oversized black frayed-end scarf, and a cosy brown overcoat. This style is finished off with a leather handbag and shades. Andy Csinger wears black and white low-top converse with rolled distressed jeans, and a cosy black knitted sweater. Sweater: H&M, Jeans: Topshop, Shoes: Converse. Converse are the perfect choice for almost any street style look. 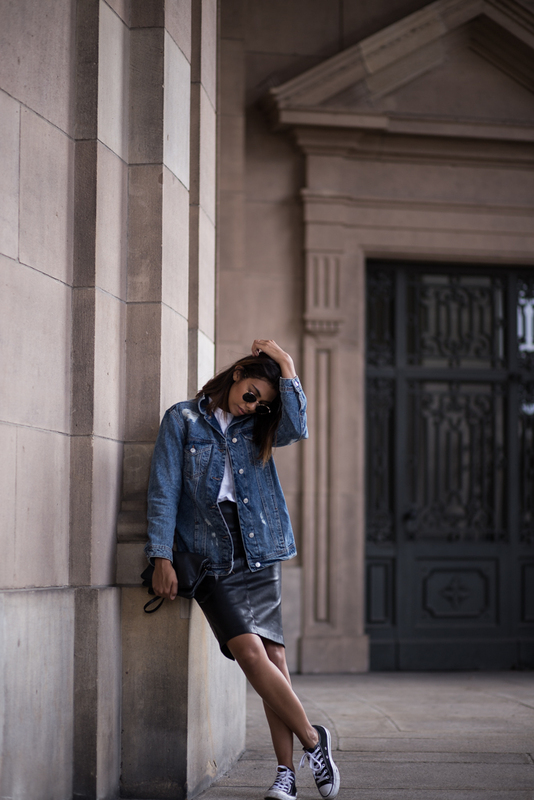 This urban style, consisting of an oversized denim jacket and a leather midi skirt, goes excellently with a pair of classic black converse. Via Storm and Andrea. Classic black converse are the ideal match to an outfit consisting of culottes and an off the shoulder top, such as this one. Federica L. has achieved the perfect match of preppy chic and sophistication, making this outfit a must try! Trousers: Pull & Bear, Shoes: Converse. Lucy Williams has paired classic black Chuck Taylor Converse with a midi dress here for a retro and vintage style which is perfect for summer! Wear this look with a denim jacket like Lucy to get that authentic fifties feel! Dress: Mango, Jacket: Levis, Bag: Gucci, Trainers: Converse. White converse make the perfect match to a white mini dress like this one, worn by Alexandra Pereira. The colours of these pieces compliment each other excellently, resulting in a super cute white and red style! Dress: Buylevard, Sneakers: Converse, Bag: Zara. Wear converse with a cable knit cardigan and a pair of ripped black jeans to steal Federica L.’s cute and casual style. This look is affordable and achievable; what’s not to love? Cardigan: Asos, Top: Zara, Jeans: Bershka, Shoes: Converse. Classic black converse are everyone’s go-to footwear with a pair of jeans for good reason! Zoé Alalouch looks stylish and casual in this outfit consisting of a simple V neck tee, a black trench, and a pair of black Chuck Taylor’s. Trench: H&M, Top: Sézane, Jeans: Current Elliott, Bag: A.m.a.n.d. Cindy Van Der Heyden is looking ultra alternative in a dark and mysterious style consisting of leather leggings, a royal navy overcoat and a pair of classic black converse; a must have this season! Trousers: Muubaa, Blouse/Coat: H&M, Sneakers: Converse. 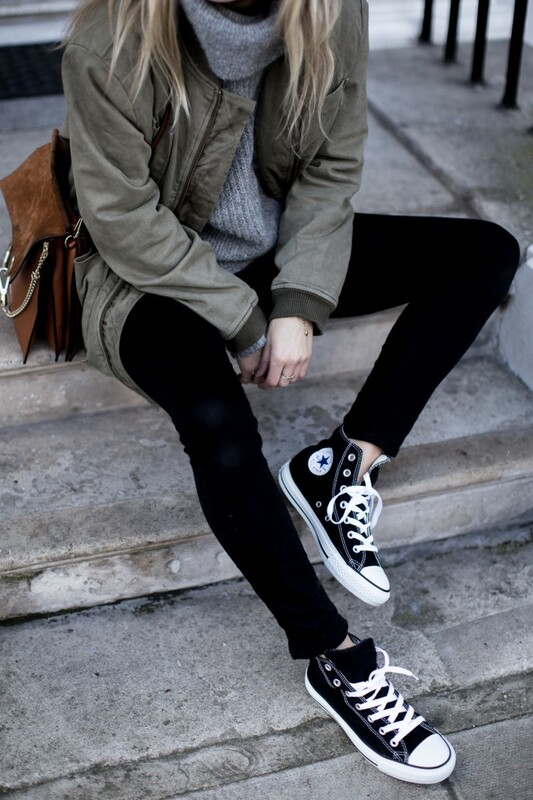 Converse and a bomber jacket is the perfect combination for a truly retro fifties style! This all-American style varsity bomber is a throwback item, and looks great worn with a cute black mini skirt and classic black Chuck Taylor’s. Via Federica L.
Bomber: Mango, Skirt: Zara, Shoes: Converse. Kick it in a pair of ankle high converse like Stella Wants To Die this summer! This classic style is perfect with jeans, a skirt, or even a dress; as demonstrated by Stella’s stylish maxi dress and converse outfit. Dress/Trench: Compañía Fantástica, Bag: Gucci, Sneakers: Converse. Katarzyna Tusk has chosen to use converse as an injection of colour into her every day outfit here! These classic red Chuck Taylor’s look bright and summery worn with a beige sweater and black jeans. Sweater: Mango, Trousers: Topshop, Shoes: Converse, Bag: Trendsetterka.com. Converse will look awesome worn with a maxi skirt! Katarzyna Tusk shows how to wear white converse, pairing them with a flowing grey skirt adn a cropped denim jacket. 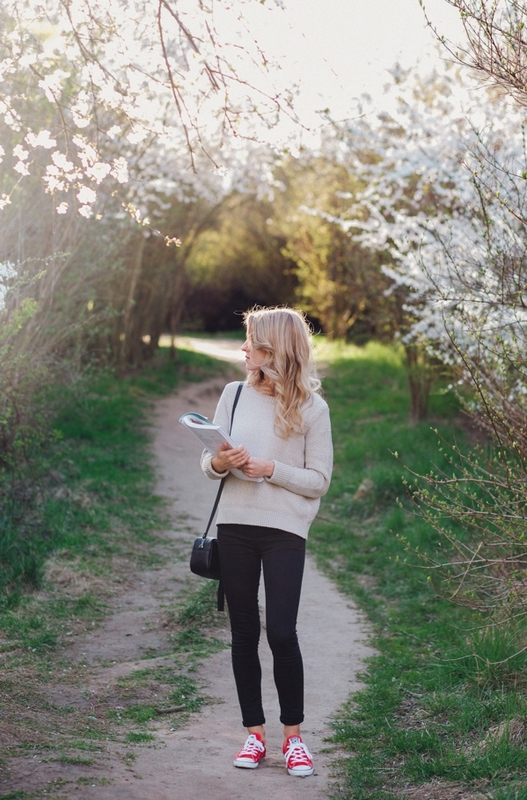 We love this fresh spring style! Jacket: River Island, Shoes: Converse, Top: COS, Skirt: Taranko, Bag: Zara. Julie Sarinana demonstrates the versatility of converse here, wearing them with a more sophisticated work look consisting of an oversized knit cardigan and a gorgeous Givenchy briefcase. Cardigan: Asos, Jeans: Asos, Shoes: Converse, Scarf: Zara, Bag: Givenchy. Converse are the perfect footwear choice for an outfit such as Mirjam Flatau’s, which consists of a destroyed black tee, oversized distressed denim, and an aztec style poncho. Poncho: Edited, Jeans/Tee: Citezens Of Humanity, Shoes: Converse. Thin soled Converse are the perfect match to bare legs and a skirt, as seen worn here by Sara Donaldson. This look is summery and sweet, we love it! Jacket: IRO, Skirt: Albus Lumen, Cami: ASOS, Sneakers: Converse, Tote: TDE. Wear your converse with loose laces to get the casual feel demoed here by Lucy Williams. This look is perfect for hitting the streets or travelling due to its easiness and comfort! Jacket: Anine Bing, Jumper: & Other Stories, Jeans: Acne. 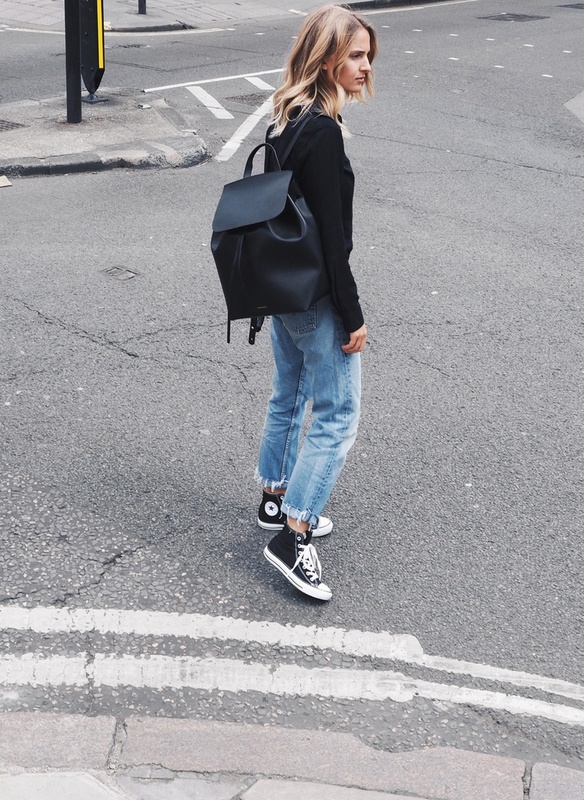 Wear classic black converse like Coline by pairing them with slouchy tomboy style trousers and a simple knit top. We love this androgynous jogger style. Jacket: Hunky Dory, Top: En Dentelle Vila, Trousers: Diesel, Shoes: Converse. 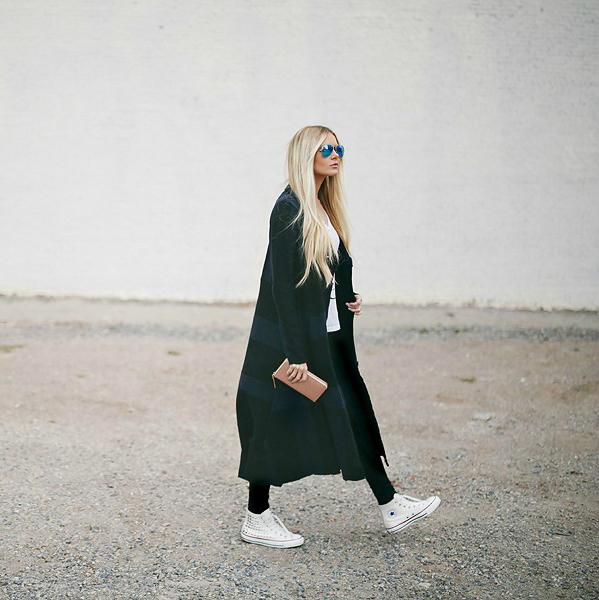 Ankle high converse are the perfect match to a maxi coat outfit like this one worn by Rosanna van Billie-Rose. 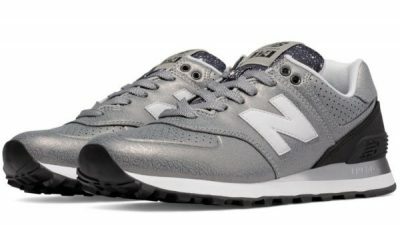 Casual and cool, these grey converse are an easy pick that will always look great. Coat: Mango, Skirt: Zara, Scarf: Weekday, Bag: Guess, Shoes: Converse. There is a reason converse will always be our footwear of choice! 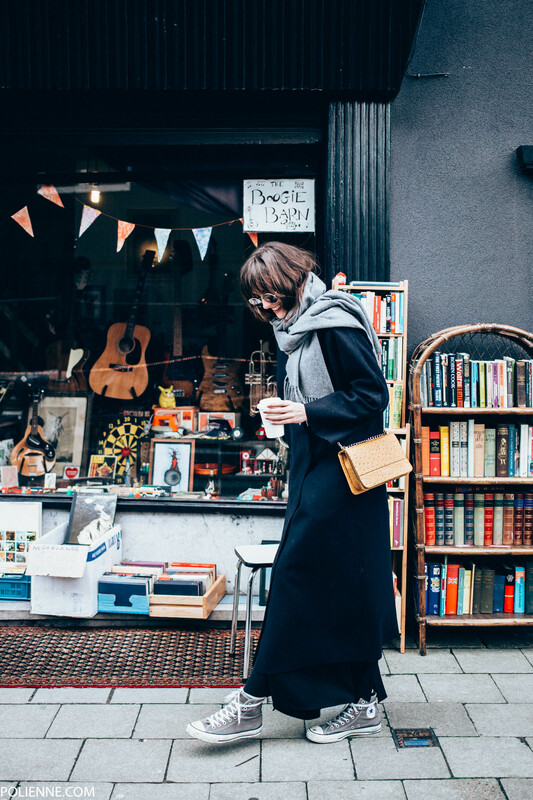 Pavlína Jágrová demonstrates how to wear classic black converse, wearing them with a cute outfit consisting of a black sweater, jeans, and a smart grey overcoat. Coat: New Yorker, Sweater: Lindex, Top: H&M, Jeans: Levi’s, Bag: Celine, Shoes: Converse. Caroline Daur is a vision in greyscale, wearing a pair of simple black and white converse with ripped grey jeans and a matching turtleeck to create an easy but sophisticated style. Sweater/Jeans: Review, Shoes: Converse, Bags: Aigner, Coat: Asos. Mixing different shades of black and grey, Barbora Ondrackova is smashing the monochrome trend! We love this casual outfit, consisting of a scarf, leather jacket, jeans and ankle high converse. Jacket: Chiquelle, Jeans: Topshop, Shoes: Converse, Bag: Saint Laurent, Watch: Marc Jacobs, Scarf: H&M. Alexandra Guerain wears a pair of sixties classic ankle high converse with cropped mom jeans and a simple white blouse, combined with layered black jackets to get that authentic style. Blouse/Jacket: Asos, Jeans: Levi’s, Shoes: Converse. Converse are the perfect choice for a slouchy lounge-wear look like this one worn by Camille Callen. Casual but stylish, we recommend you choose converse for an outfit similar to this. Classic black converse look their best when worn with darker colours. Pavlína Jágrová wears the trend with a pale grey sweater and coat matched with black jeans and a beanie. Anine Bing keeps it casual, wearing her navy converse with leather leggings and a soft white knit. We would happily recommend navy converse as a match to almost anything. Sweater/Leggings: Anine Bing, Bag: Jimmy Choo, Shoes: Converse. Don’t be afraid to wear converse with a skirt. Ellen Claesson shows us how simple black converse can be the perfect match to a leather skirt and knit pullover. Black converse go with almost anything. We love Caroline Daur’s converse look, consisting of leather trousers, a white coat, and a gorgeous brown Balenciaga bag. Sweater: Miss Goodlife, Trousers: St. Emile, Shoes: Converse , Case: Balenciaga, Coat: Asos. Wearing your white Converse with a pastel coloured coat will create a wonderful autumn look. Nicoletta Reggio wears this outfit with distressed jeans and a cute grey scarf. Coat: Prada, Sweater: Romwe, Scarf: Zara, Jeans: Zara, Shoes: Converse: Sarenza.it, Bag: Fendi from Gasmy.it. Wear an all navy outfit with converse and embrace your inner sailor like Danielle Bernstein, who wears a vintage blazer and blue cigarette trousers. Trousers: Topshop, Top: ASOS, Vintage Blazer: Own, Shoes: Converse. Try wearing a pair of black ankle high Converse with a mini dress like Julie Sarinana. Jacket: Aqua Moto, Dress: Leith, Shoes: Converse. A camel coloured coat and black skinny jeans go wonderfully with a pair of navy converse. Via Katarzyna Tusk. Trousers: Moto by Topshop, Hoodie: Abercrombie & Fitch, Coat: Sisley, Shoes: Converse. White Converse trainers go beautifully with lace. 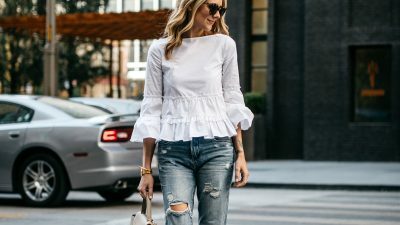 Try wearing yours with shorts and a lace fringed top like Sara Escudero. Amber Fillerup Clark completes her casual jumper and jeans look with a pair of studded Chuck Taylor Converse. Tee: Maj Tee’s c/o, Sweater: Rag & Bone, Trousers: 7 For All Mankind, Shoes: Converse Outfits. Amber Fillerup Clark rocks this oversized long cardigan by pairing it with cool ankle high converse. 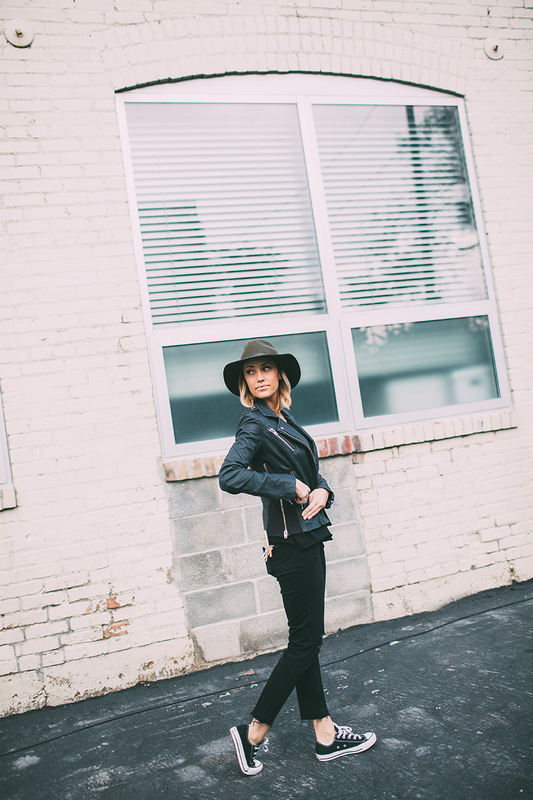 Coat: Free People, Tee: Nordstrom, Trousers: 7 for all Mankind, Clutch: Kate Spade. Add some colour to your outfit with a pair of red converse and rolled up boyfriend jeans. Via Jill Lansky. 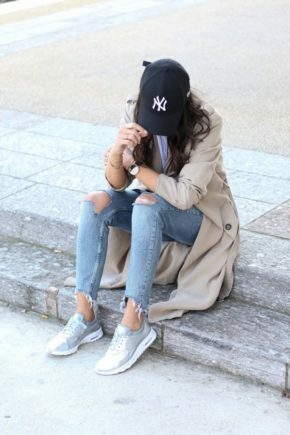 Coat: H&M, Tee, jeans: Zara, Shoes: Converse Outfits, Glasses: Celine, Hat: Artizia. Try wearing a long coat with skinny black jeans and converse like Larisa Costea. 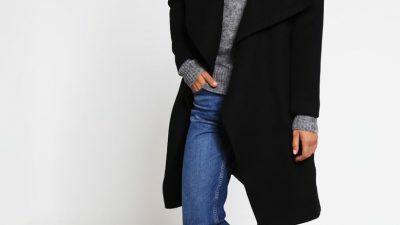 Coat: Missguided, Sweater: Sheinside, Jeans: Zara, Shoes: Converse Outfits. 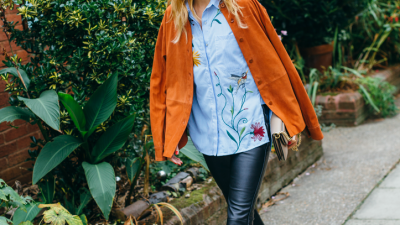 This cute denim jacket goes a treat with Blair Eadie’s classic converse. Leggings: Current/Elliott, Shoes: Converse, Bag: Mansur Gavriel, Denim Trucker: Marc by Marc Jacobs. Outfits With Converse. 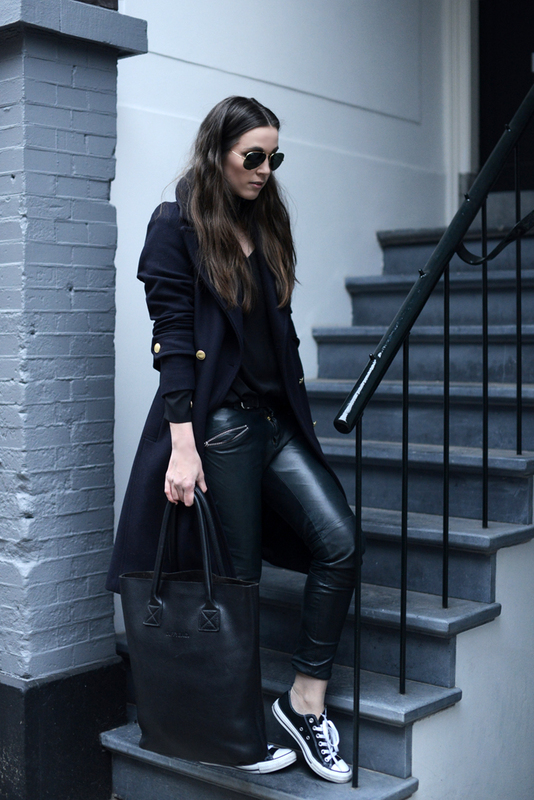 Black converse are the perfect finish to Katarzyna Tusk’s trench coat and leather trousers outfit. Trousers: Mango, Sweater: Vila by Answear.com, Coat: Zara, Bag: Minelli. Converse Outfits. Julie Sarinana wears a cute green knit cardigan with her ankle high chuck taylors. Classic black converse really do go with anything! Cardigan: Anine Bing, Converse Outfits. Ankle high converse look edgy and sleek when worn with ripped mom jeans and a casual black shirt. Via Mirjam Flatau. Jeans: Levi, Shoes: Converse, Shirt: Rails. Outfits With Converse. Marianna Mäkelä wears cute floral dress with her black converse. A great example of how to wear Converse in summer. Dress: Model’s Own, Shoes: Converse Outfits. Try wearing your converse with skinny black jeans and a leather jacket. Via Megan Anderson. This is one sure fire way of how to wear Converse: Leather trousers are a winner with ankle high converse and a denim jacket. Via calluswhatever.com. Brands not specified. Converse Outfits. These navy converse go brilliantly with classic jeans and a white blouse. Via creatorsofdesire. These black converse look cute and casual paired with skinny jeans and a blazer. A perferct example of how to wear Converse. Via Marianna Mäkelä. Coat: Tiger of Sweden, Knit: Hunkydory, Jeans: Zara. Shoes: Converse Outfits.